HÀ NỘI — Becamex Bình Dương expect to grab their second win at the Asian Football Confederation Cup when they meet Shan United on April 16 at Gò Đậu Stadium. It will be their second clash in Group G within two weeks. Bình Dương beat Myanmar’s Shan United 2-1 at the Thuwunna Stadium in Yangon to help them stay in third position in their group while Shan remain pointless at the bottom. Bình Dương are five points behind group leaders Ceres Negros of the Philippines and need a victory to remain in the hunt for first place. “We have been preparing well for this match. My players are in the best condition and ready to host Shan United,” said acting coach Nguyễn Thanh Sơn of Becamex Bình Dương at a press briefing on April 15. “In the first leg match we won away from home, so we are looking to secure a second win here at home to remain in the race for top place,” he said. Sơn said he would have several changes for the match as his players needed to save energy for a tight domestic schedule. 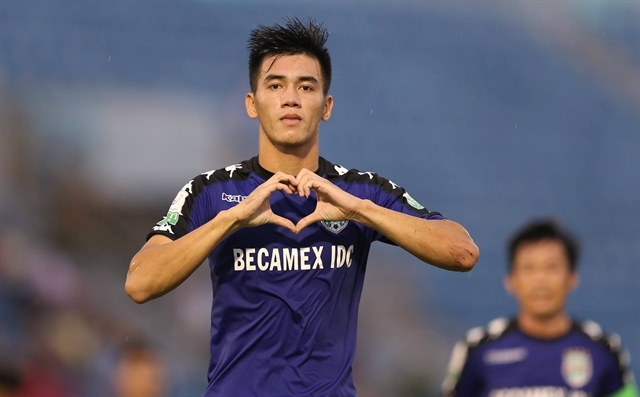 He said talented striker Nguyễn Tiến Linh would be back in action after a month out with injury. His No 1 goalkeeper Bùi Tấn Trường would be suspended following internal disciplinary actions. Responding to reporters questions about Trường, Sơn said his performance and attitude during practice would dictate when he returned. Trường’s mistakes led to Bình Dương’s 3-1 defeat to Ceres Negros on March 12. The club's managers said they were serious technical mistakes and sent him to the bench in all competitions until June 6. The other match in Group G between Ceres Negros and Indonesia’s Persija Jakarta will be held on April 23 at the Gelora Bung Karno Stadium in Jakarta. Hà Nội FC will play hosts Yangon United, also from Myanmar, on April 17. In their last round match, Yangon beat the V.League 1 champions 1-0 at Hàng Đẫy Stadium in Hà Nội two weeks ago. The Myanmar side remain bottom of the table but are just a point behind Hà Nội who are in second place with four points.